Install the Word, Excel, or PowerPoint app on your Android phone or tablet so you can read, review, edit, and share your documents. If you have a qualifying Office 365 plan and sign in to the app with the Microsoft account or work or school account that's associated with your Office 365 subscription, you'll have access to the app's extra features. If you don't have any Office for Android apps installed, download the apps from the Google Play Store. Tip: The Office for Android apps are separate downloads in the Google Play Store. Search the store for Word, Excel, PowerPoint, and OneNote, or use the links below to go there directly. Note: If you try to install and receive the error “Device is not compatible” this means your device either doesn't meet the system requirements, or it isn't a supported device at this time. Tap any Office app to open it. Swipe through the introduction, and tap Sign In. To use the extra features in the app, on the Sign in page, type the personal Microsoft account or work or school account that's associated with your Office 365 subscription, and then tap Next. Type your Password, and then tap Sign in. You might be prompted to add a Dropbox account. Select Connect to add it now, or Not now if don't have one, or if you want to add one later. Tap Create and Edit Documents to start working on your documents. Note: To troubleshoot sign in issues, see What you can do in the Office apps on an Android, iOS, or Windows mobile device with an Office 365 plan. 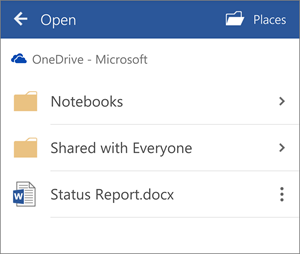 After you complete the sign in process on one of the Office apps, your account and the OneDrive for Business service is automatically added to the other Office apps installed on your Android device. 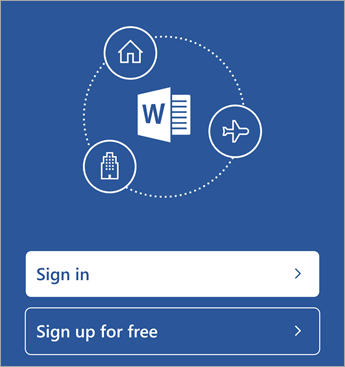 If you installed any Office for Android app, but set it up with a different account, for example a Microsoft account like outlook.com, you can also add your work or school account to access documents you saved in OneDrive for Business, SharePoint team sites, or document libraries. Or, if you added a work or school account set up you can go ahead and add a Microsoft account such as the one associated with your Office 365 Home, University, or Personal subscription. Note: What work documents you can edit depends if you have a qualifying Office 365 for business or education subscription and if you have an Office license assigned. See How Word, Excel, PowerPoint, or OneNote apps work on Android or iOS devices. Open Word, Excel, PowerPoint, or OneNote on your Android device. In Word, Excel, or PowerPoint tap Account, and then tap Add a Place. 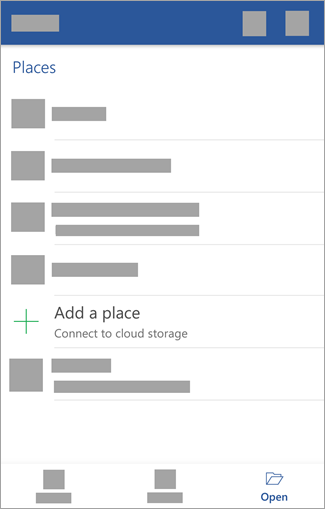 Depending on which OneDrive service you want to access (for example, OneDrive for your personal documents or OneDrive for Business for your work or school documents), tap OneDrive or OneDrive for Business, type your personal Microsoft account or the work or school account associated with your Office 365 subscription, and then tap Sign in. The service is now added to your account. Tip: After you complete the sign in process on one of the Office apps, your account and the OneDrive for Business service is automatically added to the other Office apps installed on your Android device. Select from below to see how you can access help from within the app to learn more about deleting, sharing, saving, and syncing files, or using the app if you're offline. Or to check if your device meets the system requirements for the app. From the Word, Excel, or PowerPoint app, open or create a document and tap AutoSave > Help and Support. From the OneNote app, tap Settings > Help.